Do you struggle with impostor syndrome? Impostor syndrome is a term describing an uneasy sense that you’re somehow getting away with something. An anxious feeling that you are not good enough in some way, and that if others knew the truth about you they’d be disappointed or even repelled. Don’t worry – there’s hope! 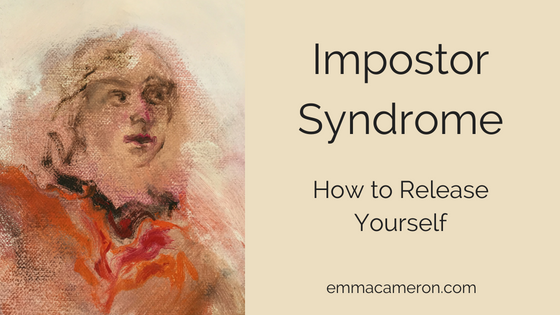 In this blog post, I’ve collected together five ways that you can help yourself loosen the grip of impostor syndrome. Can I completely get rid of my impostor syndrome? Maybe, or maybe not. But you can ease it so it doesn’t have that same grip on you. And when it does pop up again – which may happen through life as you transition into new challenges – you may find it has a less harsh quality, and is much easier to calm. Impostor syndrome is not a mental health diagnosis, so don’t worry – it’s just a term that was coined in the 70’s to describe a cluster of features that many of us have, to greater or lesser extents. Impostor syndrome is connected to shame, and as Brene Brown tells us, shame needs three things and it’ll grow exponentially: secrecy, silence and judgement. So stepping out of the secrecy and silence, and talking to friends and loved ones about your impostor syndrome can be very helpful. But do make sure you choose the right people to talk with – if someone is going to judge you when you share vulnerably with them, that will not help you at all. Feel like a kid in an adult’s body? Well, in a way, you are (and so am I). The self is not really a single unified entity. Different self-states (or ‘parts’) may be dominant at different times. The child part of you certainly doesn’t feel equipped to manage all the demands of being a competent, capable adult. And/or, an adult part of you may have trouble being relaxed and playful when with others, and so you feel anxiety in certain social situations where you’re supposed to ‘just be yourself’. Of course you don’t know everything about your line of work, or about parenting, or whatever it might be. That doesn’t mean you’re a fraud – it just means there is always more to learn. And the learning and growing can be so much fun, and so rewarding! What does your impostor syndrome want you to realise? Maybe the reason you feel an impostor in your career as a lawyer, is that deep-down your heart is calling you to make some time for painting, performing or writing? Is your impostor syndrome linked to too much emphasis on tangible end results? Could you slow down sometimes, becoming aware of all the other elements of any activity or project you’re involved with? Focusing on goals, results, and outcomes, can be helpful at times. But there is enormous value in the process too. The way we do things is often just as important (sometimes more so) as what we end up with. Sometimes, what seems like impostor syndrome can actually be your conscience trying to speak frankly to you! Your conscience – an inner sense of right and wrong – can be your ally and guide through life. But many of us get so caught up in feelings of guilt and shame that we stop being able to simply hear and act upon the good information that comes from the conscience. If your conscience is speaking to you because you know deep-down that you don’t really have a depth of skills and knowledge, don’t try and push down that awareness. Equally, don’t let shame and guilt confound you and stop you growing. Instead, use self-compassion to help yourself acknowledge and build on your existing strengths. Challenge yourself to expand and learn, in whatever way feels appropriate and possible. A little self-compassion can go a very long way. Self-compassion is absolutely vital if you’re trying to soften your impostor syndrome. Recognise that it hurts to feel so insecure, and be gentle on yourself, just as you might be for a loved one who was hurting in that way. I can’t overstate how important this is. You cannot be perfect. Being perfect is simply not possible! Accepting that you are imperfect does not mean settling for a mediocre life and non-achievement – even though that is what many people fear. Accepting that you are imperfect means that you can open up to a richer, fuller life full of interest and variety, because you’ll be less fixated on your attempts to become perfect, and consequently more able to enjoy what’s actually happening. Your achievements might be visible in the form of certificates (like degrees and trainings), or your job title. Equally though, your achievements may be evident in the family you are raising, the way you touch people’s lives and really make a difference, or simply the fact that you get up every morning and keep going despite the odds. Whatever form your achievements take, please don’t dismiss them. Own, acknowledge and relish them. And think back to a time when you hadn’t got as far, or didn’t have to struggle with the things you’re currently dealing with. We all have an inner sat-nav which we can (with practice) tune into. It’s based on intuition and emotion, and when that’s combined with the observing self it can provide a wonderful guidance system. Start with practising doing the body check-in – you’ll find instructions for how to do this in Body Check-In, Your Secret Tool for Self-Awareness. Our brains are biologically wired to focus in more on the bad stuff. We may have to be quite intentional about feeling good, because for many of us it doesn’t come naturally. When you notice a good thing (like a report you’ve successfully completed, or a loving kiss from your child) then take a few moments to register it fully in your mind and body. Gradually build your tolerance for these good feelings. Many people struggle with ‘foreboding joy’ – the fear that when we acknowledge and fully experience something good, then it means a bad thing will happen. Lots of repeated practice is required, so that you get better at allowing yourself to have good feelings without the need to diminish them. ‘It’s all going to come crashing down’, ‘I just got lucky this time – next time it’ll be a disaster’, and ‘I’ll never be any good at this’ are just thoughts. Self-defeating ones. You don’t have to believe them, even if they feel real. A thought can be ‘real but not true’ says Tara Brach, meaning that it can feel totally real but not have much basis in solid fact. Building up a daily mindfulness practice can be a great help, and CBT skills can help with identifying unhelpful thoughts. Here’s another little trick that can help, when repeatedly practised over time. Whenever you notice that you’re having self-critical and self-defeating thoughts, preface it with “I have the thought that…”. This can help you recognise that thoughts are just thoughts, and may not be accurate reflections of reality. If impostor syndrome is a problem for you, that’s probably a sign that you may be ‘projecting’ qualities etc onto other people in a way that idealises (and/or devalues) them. The other person could be someone you work with, meet every day at the school gates, or do business with – or they could be someone you only come across online or from a distance. If they seem to be so amazingly great in some way that you feel you are not, can you let yourself start to see them as ‘normal’, a mixture of qualities – and allow yourself to have some of those desired qualities too. 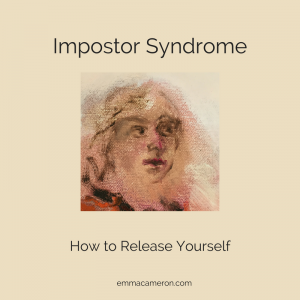 Impostor syndrome is self-centred, getting us caught up in fearfully watching ourselves and others. We’re so busy trying to head off the ‘inevitable’ moment when we’ll be exposed for all to see, that our attention stays self-focused, instead of moving fluidly to and fro between self and others. Instead, practise using your senses to mindfully observe whatever is happening around you in the here-and-now. And be genuinely interested in the other people you interact with, really listening to them instead of just thinking about what you’ll say when it’s your turn to speak. Others can do their things their way; you can do your things your way. You don’t have to be all things to all people. You just have to be ‘good-enough’ for what you are working on. We may have complicated unresolved feelings about some other, deeper issue in our life. For example, we may have suffered trauma that still needs to be processed, or difficulties resulting from attachment issues from childhood. This might be one area in which self-help isn’t enough, and we need a skilled therapist to assist and support us. How often do you say ‘I should’ or ‘I really ought to’ without stopping to muse about the effect these self-exhortations have on your mood and behaviour? Do all your ‘shoulds’ (and ‘shouldn’ts’) actually lead you to behave the way in accordance with your deeper motivations and desires? Or are they little more than a stick to beat yourself (ineffectively) with? Limiting the shoulding, and being more mindful when you use that language, can really help you align with something more authentic within. It can sometimes be helpful to identify where your inner ‘you’re not good enough/ you’re a fake’ voice originated. Maybe a parent, sibling, or teacher planted the seeds in your mind. If you’re not sure, see if you can tune into yourself to get clearer on the felt quality of that voice. Using the form of words “Something in me feels…” can be very helpful. My blog post How to Love Yourself gives more guidance on how to do this. Could impostor syndrome be a sign of trauma? Sometimes, what looks like impostor syndrome can actually be a sign of trauma. Trauma can include things like being assaulted, being involved in a traffic accident, witnessing an attack, abuse, repeated bullying, having to flee a dangerous situation, and many other things. When something traumatic happens, and if no-one is there with us who is able to help us to process and metabolise it, it can happen that a kind of ‘split’ occurs inside. There’s the part that can get on with everyday life, and then there’s another part that is deeply traumatised and gets stuck in what therapists call ‘trauma time’. This can lead to a profound sense of ‘something broken inside’, or just a deep sense of confusion and inner fog, perhaps with some behaviours that puzzle you or don’t seem to ‘fit’. And the earlier in life the trauma happened, the more entrenched the problem may be. If you think this might apply to you, the above tips will certainly help. But self-help techniques on their own will not be enough, and you’ll probably need to also do some work with a trauma-informed therapist. Sorry if this adds to the confusion, but there are times when acting ‘as if’ can be helpful and lead to genuine change. An example: You’ve been quaking inside, but you summon the inner resources to walk into a meeting offering a firm handshake, with your posture erect and a confident smile on your face. And after a while, you realise you actually do feel more confident inside. Acting ‘as if’ in this way can actually set off a positive feedback loop of chemical signals between your body and brain, that allow you to actually become genuinely more confident and less anxious. (Read ‘Presence’ by Amy Cuddy, for more on this). In another post, ‘Do You Sometimes Feel Like a Fraud?’ I give examples of two impostor syndrome sufferers, Delia and Sally, and how they used therapy as part of their process of healing and growth. If you’d like to give therapy a try, and you’re within reach of Colchester, Essex (or you want to work online) contact me so we can discuss whether I could be of help. Your impostor syndrome is not set in stone! 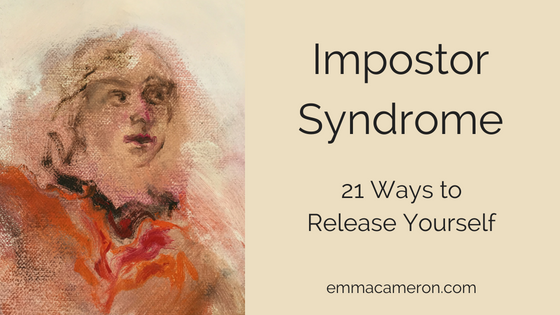 Your impostor syndrome may be deeply wired into you, and will take time to soften, so keep practising. Don’t just pick one of these tips and only try it a few times; instead, work on many of these ideas, over and over and over again. Get a therapist to help, if you want deeper progress, or if unresolved trauma is part of your experience. And you’ll find it is so worth it! Over time you really can start to feel more peaceful and more genuine. And when the impostor syndrome rears up again (as it probably will, when you ‘level up’ and aim higher in your life) you’ll be ready to deal with the next level of feeling like a fraud and an impostor! Share your thoughts about what helps with impostor syndrome, in the comments below. I look forward to reading about what works for you!